From Berlin to Prague, explore layers of European history and famous World Heritage sites. Berlin beckons with cosmopolitan flair and legendary nightlife. Prague's architectural gems compete for your attention. Then discover the best of Budapest including ornate thermal spas, fabulous Hungarian food, and stunning castles along the famous Danube River. Explore the area from a different perspective— the water. Our kayak tour starts at Glienicke Bridge, which connects Potsdam to Berlin and is where East and West exchanged secret agents and spies until into the 1980s. We’ll pass Glienicke Palace, the Truman Villa, and the Pfaueninsel (Peacock Island), where Friedrich Wilhelm II's white palace is located. After our kayak trip we’ll visit Potsdam and the UNESCO World Heritage site Sanssouci Palace and park. Potsdam was transformed into one of Europe's most splendid royal cities by Prussian king Frederick William I and his son Frederick the Great. The cost includes round-trip transfers, equipment rental. Approx. duration of excursion is 4 hours. The cost includes round-trip ransfer, dinner at an old Bohemian tavern in Kutna Hora, wine tasting, Kutná Hora – Sedlec, guided tour-by-night of Cathedral, Gregorian chants with organ music, "Splendissima Basilica" Movie, Guided tour-by-night of Crypt-Ossuary. Approx. duration of excursion is 6 hours. The Hospital in the Rock Museum (Sziklakórház Atombunker Múzeum) is part of an approximately 6-mile (10-km) stretch of interconnected caves and cellars below Buda Castle Hill. This museum is dedicated to a former secret emergency hospital and nuclear bunker.The history of this emergency hospital goes back to World War II, when Castle District was part of the Government Quarter. The caves and tunnels were connected and fortified and used as an air raid shelter. By orders of the city mayor, an emergency surgical hospital was built within the caves beneath Buda Castle Hill as well. It was used during WW II until July 1945 and then during the 1956 Revolution to treat wounded civilians and soldiers. Between 1958 and 1962 it was expanded to withstand potential chemical and nuclear attacks during the Cold War. The "Hospital in the Rock – Secret Emergency Hospital and Nuclear Bunker" opened to the public in 2008. The cost includes round-trip transfer and a one-hour guided tour. Embark on your overnight journey to Germany’s capital city. After settling in at the hotel, use your Berlin pass to start exploring the city. This handy card is not only a travel card, with unlimited use of public transportation, but also offers free admission to some of Berlin’s most fascinating museums and sights. Tonight, meet fellow travel companions at a welcome orientation with your tour director. Explore the city streets of Berlin today with our local guide. Along the way we’ll delve into historical happenings including tales of espionage and intrigue, learn of the World War II destruction and see Checkpoint Charlie where the infamous Berlin Wall once divided East from West. Remnants of the wall still remain. Join us for lunch at the famous Kaefer Restaurant inside the glass-domed Reichstag. After being destroyed in the war, the Reichstag was redesigned as the modern Parliament building while retaining its historical dimensions. Tonight, venture into the former East Berlin to find great restaurants and people watching. Berlin’s legendary nightlife offers many trendy bars, clubs and cabarets. Enjoy a free day to continue exploring iconic Berlin on your own. Take advantage of your Berlin pass and visit the UNESCO World Heritage Site, Museumsinsel (island), the Charlottenburg Palace or famous Berlin Zoo. Don’t forget to try a Currywurst with Champagne for lunch or visit the KaDeWe where one entire floor of the building is dedicated to your culinary senses. If you prefer a group activity, join us for an optional kayak ride to Potsdam. This morning we board our train to Prague, capital of the Czech Republic and golden city of castles and Kafka. Upon arrival, enjoy free time to wander the cobbled streets of this city of a hundred spires — considered Europe’s best preserved old town. Walk over the 14th century Charles Bridge, lined with historic statues and alive with artists and street musicians. You may consider joining an optional visit to the Bone Church in the medieval town of Kutna Hara for a ‘Night at Sedlec Abbey’ experience. Our local guide shows us some of the famous sights today including Hradcany Castle, the home of the original Bohemian kings, the Gothic St. Vitus Cathedral, Powder Tower, and the Old Town Square with its colorful Astronomical Clock. During a free afternoon, consider a cruise on the Vltava River or spend time in the picturesque Old Town filled with colorful cafés. The entire town center is a UNESCO World Heritage site. If you are looking for souvenirs, take a look at the famous Bohemian glass, beads or garnet and amber jewelry. Our dinner tonight includes a traditional Czech folklore show. An ensemble of dancers and musicians dressed in traditional clothing will entertain, excite, and amuse. We are invited to take an active part in learning the Czech songs, dances, and games. There’s plenty to capture your attention—Czech it out! Today our train takes us to Budapest, Hungary--“Paris of the East.” In the late 18th century, two independent cities turned into one when the hilly city of Buda and the flat city of Pest were joined by the building of the Széchenyi Chain suspension bridge. Now, this vibrant city offers a bit of everything. On your free afternoon, take the funicular up Castle Hill to Buda’s Old Town, where the Budapest History Museum traces city life from Roman times. Or, shop for paprika amid the old-world architectural beauty of the Great Market Hall and explore shops on Andrássy Avenue, a UNESCO World Heritage site. 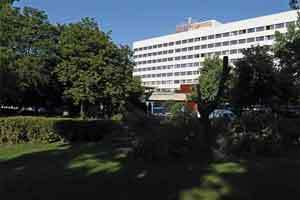 You might also consider an optional tour of Hospital in the Rock, a once-functioning hospital and war bunker now operating as a museum. Enjoy dinner on your own tonight. Consider taking a cruise on the Danube or dining on Hungarian specialties in an old wine cellar. This morning, our local historian shows us the neo-gothic Parliament and Matthias Church, where the last two Hungarian kings were crowned. We’ll also see Vajdahynyad Castle and the Citadel as well as take in the fantastic view of the city from Fisherman’s Bastion while strolling the quaint lanes and cobblestone streets of Castle Hill. During a free afternoon, indulge in a truly local experience dating back to the Romans: a spa and thermal bath. Budapest is the spa capital of the world with over 100 mineral springs and 12 therapeutic, opulent baths. Outdoor pools, healing waters, original art nouveau architecture and spa treatments await. Other possibilities are the Hungarian National Museum or strolling along Vaci Utca, a pedestrian street lined with fashionable shops and restaurants. Tonight, with gypsy violins to entertain us, we’ll share our favorite adventures at a typical csarda restaurant. Afterwards launch into Budapest’s nightlife and live it up like the locals by heading to the lively “Ruin Pubs”, a retro nightclub or riverside bar. After breakfast, say farewell to new friends and start planning your next adventure with AESU. The Pergamom is a must-see for any ancient history buffs. 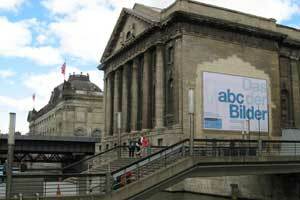 This museum is home to relics including the enormous Altar of Zeus and equally impressive Gate of Babylon. This museum was formerly the main remand prison for people detained by the Stasi. Learn about what life was like for the prisoners kept here and how political persecution worked in East Germany. For travelers who want to experience life as the locals do, Tempelhofer Park is a nice way to spend some time. This space was first a Nazi airport, then used by American planes during the Cold War and now it is a park frequented by joggers, bicyclists and kite-flyers. Explore the hidden corners of the park to find vegetable gardens, historic planes and ice-cream vendors. East Side Gallery is the longest remaining intact stretch of the Berlin Wall. Since the unification of the city, this portion of the wall has been decorated by street artists from around the world. Spend the afternoon relaxing with Berliners at one of the many beach bars. Popular throughout Germany, beach bars are a popular hangout for those wishing to relax and sunbathe with a drink. Popular spots include Deck5, situated on a roof top, or Badeschiff, which features retired ships that have been turned into swimming pools. The internationally renowned Berlin Zoo is home to over 20,000 animals from around the world. Visit with kangaroos, giraffes, polar bears and many more! This market is known to many as the most beautiful market in Europe. Peruse the vendors and try some fresh produce or a local dish like lángos (deep fried flat bread with toppings) or unicum (an herbal liqueur). Prague has a growing contemporary art movement. View the progressive exhibits of the DOX Center for Contemporary Art. Known for controversial exhibits that commentate on western culture and capitalism, viewing the galleries at DOX is sure to provoke discussion. Up-and-coming eastern European artists’ work is showcased alongside better-known contemporaries’ pieces to create a stimulating juxtaposition of art work. 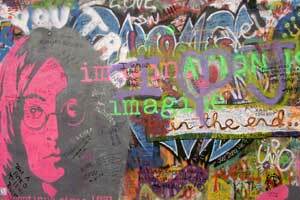 Take a walk to the Lennon Wall and be inspired by the messages of global harmony. The wall was originally a place where young Czechs would write grievances against the communist regime. John Lennon was a hero for these young pacifists and his music and lyrics were banned. When he was assassinated in 1980, his image and lyrics were painted on the wall. Communist police repeatedly painted the wall white to hide the messages and threatened jail time to anyone caught painting the wall, but every night the wall was repainted with flowers and messages. In recent times, it has become a place for people to post their art and messages of peace and love. Fans of modern architecture should visit the dancing house. Designed by Vlado Milunic, the dancing house is a surprising addition to Prague’s historic architecture. Prague is a youthful city and as such has a variety of nightlife. Drink a traditional Czech beer and listen to an array of international DJs at Karlovy Lázne, a five story night club. Or hop next door to Klub Lavká to dance under the illuminated Charles Bridge. Letná Park offers spectacular views of Prague. Go see the park’s centerpiece, a giant metronome, or stop by the well-known beer garden in the corner of the park for a traditional Czech beer. Buda is home to over 200 known underground caves. You’ll walk over them without noticing as you explore the city, and a tour can take you down to explore from the inside! These caves remain at 54°F year round as they were created by the same thermal springs that supply the famous spas above ground. Jánoshegy is Budapest’s largest hill. Take the chair lift to the top to enjoy the views. Then climb the Erzsébet kilátó tower at the top of the hill for an even better panoramic view of the city. Also known as Castle Museum because it is located in the Buda Castle, this museum covers the history of Budapest, Roman antiquities, the middle ages, and also has reconstructed parts of the Medieval Royal Palace. 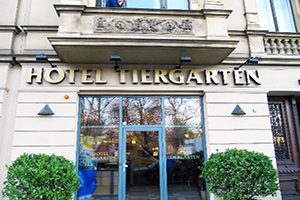 This family-run 19th-century hotel is only a 2-minute walk from Turmstraße U-Bahn station and less than 2 miles from the Brandenburg Gate. This hotel features a bar, coffee/tea in the lobby, and a meeting room. Free WiFi in public areas. Additionally, laundry facilities, a 24-hour front desk, and a computer station are onsite. Although located right in the center of Prague, just a few steps away from Wenceslas Square, this modern hotel is situated in a quiet alley. All the rooms are air-conditioned and feature free WiFi, a hairdryer, flat-screen TV, telephone, a comfortable seating area and a safe. 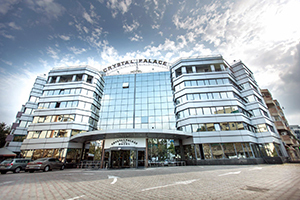 The hotel offers breakfast service, overnight laundry service and a massage center with sauna. The Danubius Hotel Flamenco is in the center of the Buda Hills, in a quiet park with a small lake. It features free access to its wellness and fitness center, an indoor poo and free Wi-F. The center of Budapest is within easy reach by publich transportation. All rooms are air-conditioned and equipped with satelite TV. * Price per person based on a twin share room. If you're traveling alone, AESU will attempt to arrange for a 2-share room (same gender). Please see rooming policy. If you prefer a single room, a single supplement of $525 will apply. Email East Meets West - 9 days to a friend!